Recognizing Innovation During the RSA® Conference 2016 February 29th, 2016 SafeDNS announced that Cyber Defense Magazine, the industry's leading electronic information security magazine and media partner of the RSA® Conference 2016, has named SafeDNS web content filtering service, winner of the Editor’s Choice in Content Management & Filtering Solutions. CDM’s recognition of SafeDNS further validates our company as an innovator in the sphere of online security and web content filtering. After many months of review and judged by leading independent information security experts, Cyber Defense Magazine is pleased to have selected SafeDNS as a winner for its web filtering service. “We’re thrilled to recognize next-generation innovation in the information security marketplace and that’s why SafeDNS has earned this award from Cyber Defense Magazine. Some of the best INFOSEC defenses come from these kinds of forward thinking players who think outside of the box,” said Pierluigi Paganini, Editor-in-Chief, Cyber Defense Magazine. SafeDNS offers a number of web filtering and parental control solutions to a wide range of customers – from families to educational institutions and libraries, to businesses and telecoms. Our internet filtering service allows users to manage access to the web and to decide what online content should be accessed from their networks and when. Complying with government regulation and corporate policies is easy with our service. Besides, its deployment adds one more layer of protection against botnets, malware and phishing complementing AV and firewalls. 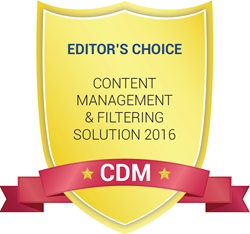 “CDM’s recognition of SafeDNS further validates our company as an innovator in the sphere of online security and web content filtering. Apart from making the internet safer, our advanced technology allows us to suit all our solutions to the exact needs of each and every customer. Whether they are parents, educators or public Wi-Fi owners using SafeDNS to protect children from inappropriate information on the web. Or telecoms getting additional revenue and increasing their brands' social responsibility with our solutions. Or employers driving productivity with SafeDNS service. This industry honor is the greatest endorsement to the fact that SafeDNS is ahead of the curve when it comes to the best-of-the-best products that can provide the highest security in content management & filtering solutions,” said Dmitry Vostretsov, CEO, SafeDNS.